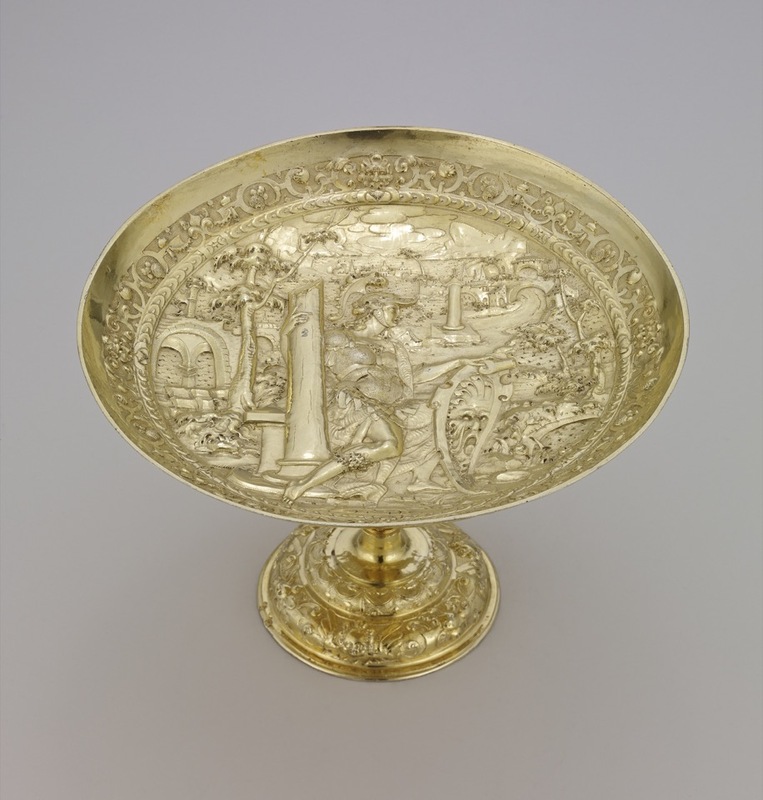 Tazza; silver-gilt; embossed and chased; Fortitude in landscape; border of strapwork scrolls etc; inscribed. ; knop chased in relief with festoons, lion masks, etc; inscribed. ; foot similar to border; bottom of foot with convex plate engraved with arms of Count von Thun of Bavaria; inscribed. Commentary of this tazza: The three versions of the Fortitude relief - the 1590 large version, the 1594 smaller version and the Waddesdon Bequest example - are all similar in general compositional terms, though the 1590 version has by far the greatest number of significant and striking differences, as Dr Weber has recorded (see Weber 1970, pp. 343-6). The sources for this figure can be traced back to various woodcuts published posthumously in Jost Amman's ‘Kunstbüchlein’. The figures in the three versions (Seling 1980, p. 254, figs 203 and 209) are all seated in the same position - without any marked contrapposto movement - though in the 1590 version Fortitude's column is tilted back into a diagonal and a lion is shown emerging from behind; furthermore, the scene of Samson and the lion is depicted in the landscape (middle distance) on the right-hand side of the tazza. The shield with a radiating design (instead of a large Mannerist mask) is to be found in both the 1590 and the 1594 versions, but the 1594 tazza has neither the attendant lion nor the scene of Samson and the lion in the landscape. Indeed, the 1594 tazza has a very similar vertical column, broken at the top, placed beside the figure of Fortitude, who is depicted holding it with her right hand in exactly the same way as on the Waddesdon Bequest tazza. The three landscapes are all very different; neither of the two tazze (in the Palazzo Pitti) incorporates the ruined building with a double-arch (seen on the left of the Waddesdon Bequest version). This same architectural feature was given a conspicuous position in the Hope tazza (cat. no. 26); in both cases Paul Hübner has used the same very distinctive form of double-arch as a means of viewing the water in the landscape behind the ruined building. This example of Hübner's eclectic use of motifs to fill his highly imaginative landscapes is valuable evidence of the rather contrived, almost theatrical, approach that one senses in the Waddesdon Bequest set of tazze.